This PDF file contains slides for your presentation. When it comes time to run your session, you type in [SESSIONSTART] in the IRC channel and all Lernid clients will go and download the PDF file and display the first slide in a small and convenient, and resizable pane within the interface. This will then change the slide and display it for all Lernid clients. 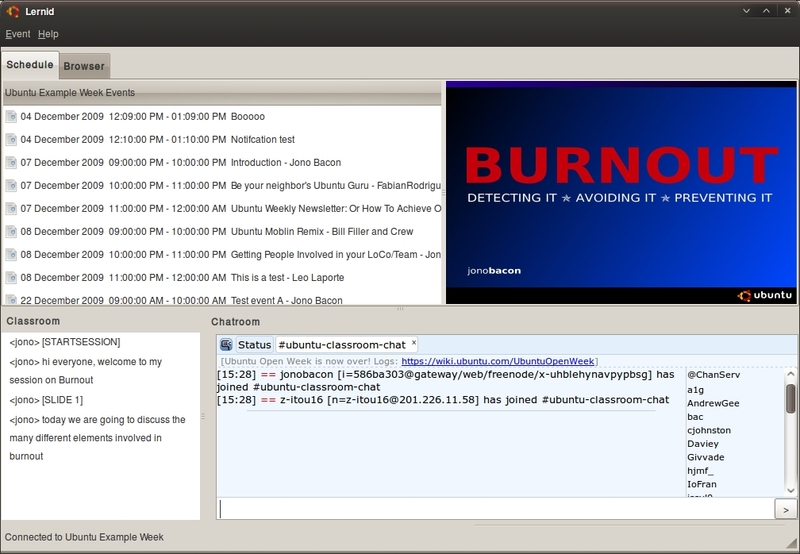 This now means that in tutorial sessions we can display presentations to viewers while the session is going on. This is a huge feature for our learning weeks. Also, don’t forget that we also have functionality built into Lernid to display URLs shown in the channel too in the built-in web browser. This is all helping Lernid to become a solid platform for online training. Can we make a default slide to show. Just like the ubuntu sign or something. It would be nice for sessions that the leader didnt make slides for. Or else could it not show up until the leader sets where the slides are? Jono, I haven’t had good things to say about Lernid to date (so I kept quiet – if you’re not going to say something good, shut the hell up – so so my mother says). However, out of left field (that’s an Americanism given that you’re that way inclined these days), you’ve implemented my killer feature. I need this lecture-casting feature! Thanks a lot. I love the way that this free software development stuff throws up solutions from where you mightn’t expect them. Next time you’re in Brighton…. Rather than stay quiet why didn’t you suggest your killer feature? I’m sure Jono welcomes feedback from educators on the features they would need before using this app. @Jimbo. I kept quiet for two reasons (1) because I wasn’t going to contribute a patch, and (2) I simply didn’t think of the feature as something in Lernid. It was only when Jono implemented it that I realised he’d solved one of my major wishlist items. Jono, this slide feature really rocks! Jono, how about button controls for the slides? Why only for session leaders? I may join a session late (or dual task between the session and something else) and miss the slide and want to go back to it? Also, what about preloading the slide for the next session? I don’t want to have to wait for the slides to load while the session leader is talking about them. Other than that, great feature! I haven’t tried it out but I love the concept of Lernid. Hi Jono, I must say that Learnid is becoming a really nice app. I have a question, what about those who join the channel after the [SESSIONSTART] command? Do they get the slides as well?